ENCINITAS FORWARD is dormant for the time being. We're keeping the site up for reference purposes but it won't be updated during the 2018 election cycle (and may not be updated in the future). This is our final poll for the 2016 election season. Now you have a chance to pick individual candidates for Mayor and for City Council as you'd see them on the ballot. Pick one candidate for Mayor and up to three candidates for City Council. If you are supporting a slate (Democrat vs. Republican), then pick two candidates instead of three for City Council to avoid giving the opposition any votes. One (anonymous) entry per household internet connection. Hit the link below to vote. 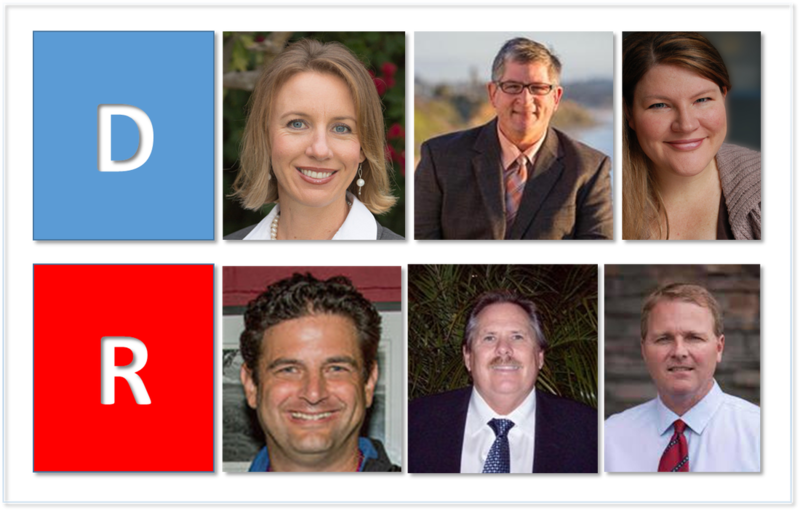 All of our Encinitas Forward reference material, news coverage, and polls have so far been limited strictly to the Encinitas mayoral race, city council races, and ballot measures - but there is another local race for County Supervisor that will arguably affect residents of Encinitas in a pretty big way. So, we thought we'd break from our regularly scheduled programming to take the pulse of the city on the two District 3 Supervisor candidates. Do you support Democrat Dave Roberts or Republican Kristin Gaspar? Dave Roberts is the Democratic incumbent. He's also the only Democrat on the five member San Diego Board of Supervisors. His background includes two terms as Mayor of Solana Beach and a stint on the Solana Beach Budget and Finance Committee. Dave also founded, owns, and operates a multi-state real estate management company. He has served as a corporate officer for SAIC (a Fortune 500 company), was a senior manager for the Healthcare Information and Management Systems Society (a non-profit), and worked for the U. S. Air Force helping to develop the military's health insurance system. Kristin Gaspar is the Republican challenger. She is currently the Mayor of Encinitas and served on the Encinitas City Council before that. She has been a principal and CFO at Gaspar Physical Therapy, a business that she and her husband founded and grew to seven offices and 150 employees. She is also a civics teacher at Mission Estancia Elementary School. You might wonder what a County Supervisor does. From Wikipedia: "Under its foundational Charter, the five-member elected San Diego County Board of Supervisors (BOS) is the county legislature. The board operates in a legislative, executive, and quasi-judicial capacity. As a legislative authority, it can pass ordinances for the unincorporated areas (ordinances that affect the whole county, like posting of restaurant ratings, must be ratified by the individual city). As an executive body, it directs the activities of the county departments. As a quasi-judicial body, the Board is the final venue of appeal in the local planning process." From a 2010 KPBS Interview: "...they control a $5 billion budget, and that $5 billion pays for various social services programs. We hear a lot about food stamps, it pays for public assistance, when we had the H1N1 outbreak it's the county's job to intervene and assess the risk. They inspect restaurants. They actually make a lot of decisions that affect your daily life." Turns out the county government is important. And the Encinitas representative matters. So this race should be on your radar as you're thinking about November 8. What do you think? Who do you support? Take our anonymous poll and then see what other engaged Encinitas residents think. Hit the link below! Encinitas Advocate article: "Mayoral Candidates Talk Mobility at Mayoral Forum"
The Coast News coverage: "Mayoral Forum Takes on a Congenial Tone"
San Diego Tribune article on Measure T Forum: "Views sharply divided on Encinitas Housing Measure"
Voice of San Diego article: "Lawyers Threaten to Sue Del Mar and Encinitas Over Housing Plans"
Voice of San Diego and NBC7 explainer: "Encinitas' Density Duel"
Moderated by the League of Women Voters. Representatives of community organizations and residents will speak for and against Measure T, the Encinitas Housing Element Update. Sponsored by Engage Encinitas. This is an excellent opportunity to learn more about this controversial ballot measure and hear arguments from both advocates and opponents. The Encinitas Library is at 540 Cornish Drive. Please get there between 5:30p and 6:00p so that the forum can begin on time at 6:00p. 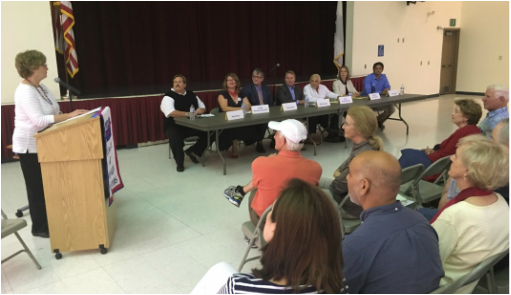 Encinitas Advocate / Del Mar Times article about the Olivenhain Candidate Forum: ​"Candidate forum focuses on Pacific View"
The Coast News coverage of the Olivenhain Forum: "Pacific View takes center stage in Olivenhain debate"
Wednesday, OCTOBER 5, 7:30pm: Olivenhain Town Council Forum. All candidates. Olivenhain Meeting Hall, 423 Rancho Santa Fe Road. Tuesday, OCTOBER 11, 7pm: Mayoral Candidate Forum. Catherine Blakespear and Paul Gaspar. Encinitas Library, 540 Cornish Drive. Tuesday, OCTOBER 18, 7pm: City Council Forum. All candidates. Encinitas Library, 540 Cornish Drive. On September 29 the San Diego Reader published an article about the community's polarization between two political slates of three candidates each (one slate from the Republican/conservative side, one from the Democratic/progressive side). This article is timely given the current poll we're running about the two slates. Most residents are not aware of the current polarization by party and the alliances within the slates, the mutual endorsements, and the flows of money and support. Candidates in each slate all endorse each other and work together. The candidates in a slate are also all endorsed by the corresponding political parties (with the Republican party endorsing Paul Gaspar, Mark Muir, and Phil Graham and the Democratic party endorsing Catherine Blakespear, Tony Kranz, and Tasha Boerner Horvath). The parties also directly support their slates with money, advice, coordination, and some direct campaigning. 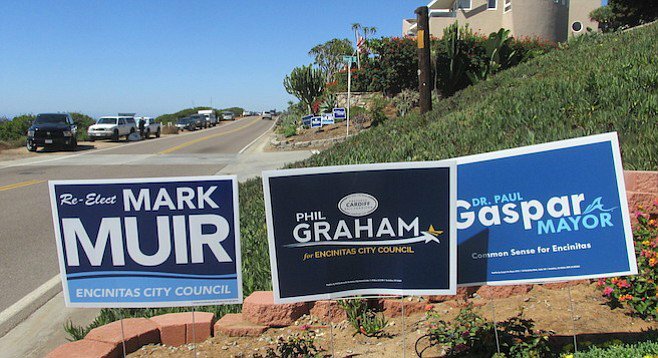 With two partisan slates vying for control of the City Council, the Encinitas election in 2016 seems like it is as far from the nonpartisan ideal as you can get.